Join us to celebrate the launch of Journeys of Hope: Challenging Discrimination and Building on Vancouver Chinatown’s Legacies! This official edition is the result of a collaboration between UBC researchers and the City of Vancouver. It includes a new chapter with photos from the City’s Apology for past discrimination against people of Chinese descent on April 22, 2018. Meet author Henry Yu and co-editors Sarah Ling and Szu Shen. Chinese migrants arrived in what is now known as Canada as early as 1788. Their contributions were often forgotten as part of a long history of racism and discrimination in Canada. 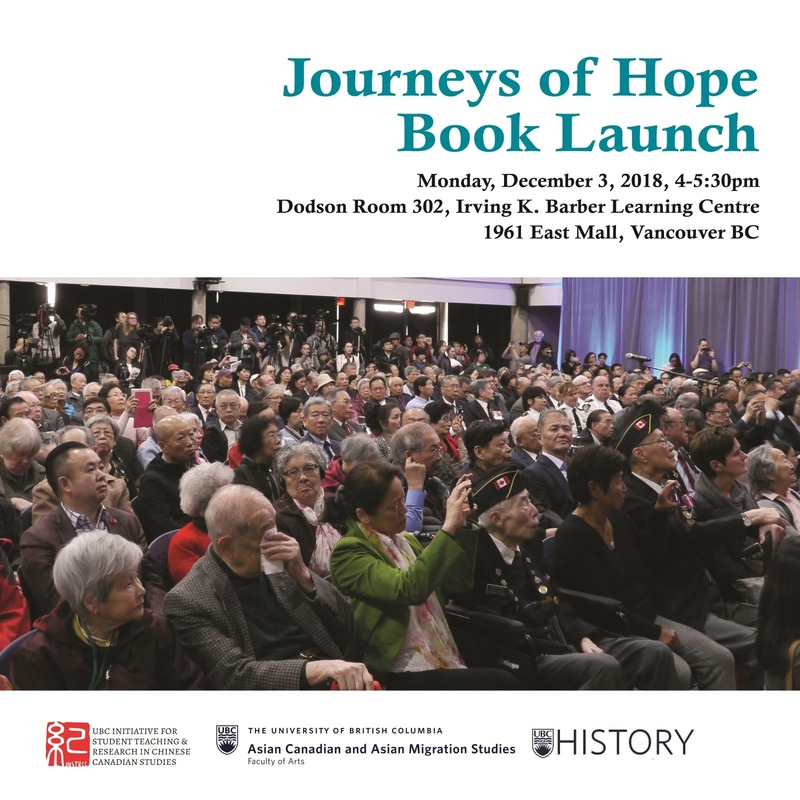 Journeys of Hope captures the story of how early Chinese migrants helped transform societies around the world, and how Vancouver’s Chinatown and other Chinatowns throughout Canada and the Pacific region are the living legacies of that transformation. Timing: The formal program wil begin at 4:15pm. Light refreshments will be provided. This book launch is co-hosted by the Asian Canadian and Asian Migration Studies Program, Department of History, and the UBC Initiative for Student Teaching and Research in Chinese Canadian Studies. Henry Yu teaches in History and the Asian Canadian and Asian Migration Studies Program at the University of British Columbia. He is the Principal at UBC St. John’s College, and Director of the Initiative for Student Teaching and Research in Chinese Canadian Studies. Sarah Ling is the Community Engagement Manager at UBC St. John’s College and President of the Chinese Canadian Historical Society of BC. Szu Shen is the Program Manager of the UBC Asian Canadian and Asian Studies Migration Program.